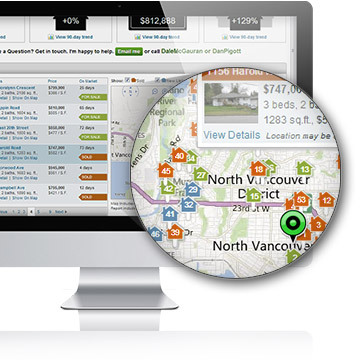 One of the most popular services that we offer to our client’s is called Market Snapshot. Market Snapshot is an essential tool for home buyers and sellers to show you local housing market trends for North Vancouver as well as surrounding areas, communities or neighbourhoods of your choice. Market Snapshot is a service that provides a weekly, monthly, quarterly or yearly updates with listing statistics, sale prices, listing inventories and days on market statistics. You select the criteria that are useful for you and the frequency that you wish to receive the report and we make it happen! Market Snapshot provides home buyers an interactive map view of all active and sold property listings, market stats, housing price trends, and listing details for homes they are interested in. For Sellers, Market Snapshot helps you quickly identify local selling prices, market trends and your closest listing competition. This is also great for those who merely like to track the market and see what is going on.